Everyone loves the beach, right? No? What if your child hates the beach? You don’t have to avoid beach vacations forever. Here are some reasons why your child hates the beach and some ideas of ways to overcome them. 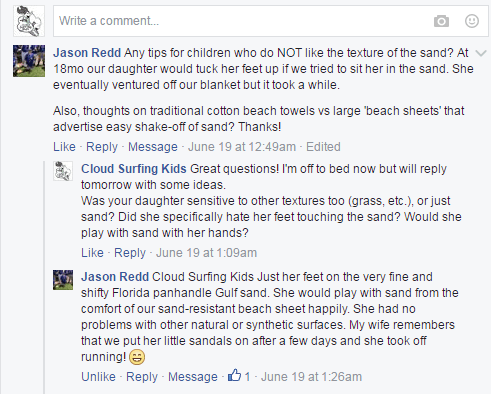 This post was inspired by Cloud Surfing Kids reader, Jason Redd, who commented on Facebook that his daughter used to hate the texture of sand. Although she is now older and has learned to enjoy the beach, I’m sure there are others like her who could use some advice. Your beach vacation doesn’t have to be a disaster, even if your child isn’t enjoying it at first. Read on to learn some steps to take to help your child overcome hating the beach. To address the “beach sheets” question: I haven’t tried them! Have any of you reading tried the large “beach sheets” that brag the sand is easy to shake off? Tell us in the comments below what you think of them compared to a regular beach towel. I have learned a lot about sensory perception from the book Understanding Your Child’s Sensory Signals, by Angie Voss, OTR. This book lists common sensory issues that sensitive children may have, gives the reason the issue occurs, and lists ways to help. I consider this book a valuable resource for every parent or teacher, even if your child isn’t particularly sensitive. Several of the ideas here come from the recommendations in this book. The feet are very sensitive and children can easily become overwhelmed by the new sensory input. New textures can be painful to a child, especially if they over-register tactile input. Sand or grass can literally cause pain, even if it feels like nothing to you. It can also throw kids off when the texture suddenly changes, like if they step on a rock or shell. The experience can be terrifying to them. Provide sand socks, water shoes, sandals, or even regular socks if that’s all you have. Massage feet with deep pressure. Use a blanket or towel to offer a “safe place” from the sand. Work up to standing in sand by allowing child to feel sand first with hands, then maybe feel it with feet without standing, then standing for a moment, then following your footsteps to walk in it. Don’t force your child to get in the sand until he/she feels comfortable. Fear of the wind can be very real. Wind is unpredictable and can be disturbing as it blows into a sensitive child’s ears. Provide earplugs, ear muffs, a hooded shirt, or towel to cover your child’s head. Bring a pop up tent to the beach. *This post contains Amazon affiliate links for your shopping convenience. When you make a purchase through these links I may receive a small commission which goes toward the operation of this website. I appreciate your support! If you’re on the beach on a very windy day, the wind might blow the sand onto you, causing a painful sensation. Provide a rash guard shirt and long pants. As a bonus you’ll be adding extra sun protection! Use a hat with a flap covering the neck. A beach tent can help here too. The ocean waves that are relaxing to you may be terrifying to your child. Like wind, the waves are unpredictable so the uncertainty might be scary for your child. Accept that it might take time to warm up to the ocean waves, and let your child come to the water on their terms. I once watched a father insist that his toddler get into the ocean when the toddler was terrified. The dad ignored his child’s pleas to stay out of the water and carried him into the waves. As he swirled the boy through the water, the child screamed in terror. Next the father let go of the boy, letting him go under the waves. He quickly took him out of the water, but as I and the other people on the beach stared at him in horror, he looked at us and said, “Well, they’ve got to learn to swim sometime, right?” We were all too shocked to reprimand him for being so mean to his child. My son John was afraid to get in the ocean until he was three. He would test the water if we held him, but for the most part he was content to play in the sand. I didn’t mind because I didn’t have to run after him as much I usually have to. There may be some truth in the idea that your child needs to get used to the water, but there is no point in creating a traumatic incident for them. If your child is afraid of the ocean, try digging a small hole in the sand and filling it with water. They can splash in this little “pool” and get used to the idea of getting wet from ocean water. Take your child for a walk along the shoreline, staying clear of the water unless they want to get closer. Once they are okay with going near the water, play “chase the waves” with them: as the waves go out, sneak down the shoreline a little. When you see a wave coming, run back up the beach and try to not get “caught” by the wave. For a very small child you might want to grab them and lift them up as the wave approaches, at least until you know they’re alright with getting splashed by the waves. The bottom line is, if your child is scared at the beach, do what you can to provide a retreat but still allow them to be on the beach and explore on their terms. It may take some time for them to warm up to the new environment, but most children do grow to enjoy their time at the beach. If your child struggled at first on the beach and you have other tips to share, I would love to hear them in the comments below! Are there any other things that make your child hate the beach?